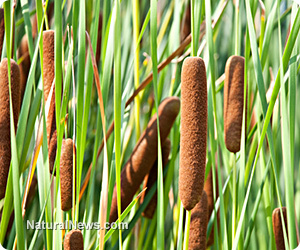 (NaturalNews) One of the most common wild plants found throughout the world, cattail, is astoundingly versatile. So much so that it can make the difference between life and death if one is lost in the wilderness or when food is in short supply. But this humble plant is also extremely handy in ordinary, day-to-day situations too. If you have access to an area with cattail, an exceptional survival resource is right at your fingertips. Early spring - Fresh shoots begin to sprout and can be dug up and (once peeled) eaten raw or sauteed. Additionally, the lower part of the leaves can be added to salads. Summer - This is the season when the uses for cattail are most abundant. Once a stem is pulled from the ground, you will notice the lower part is white. When eaten raw, it tastes similar to cucumber. Cooked, it tastes like corn. Lower cattail stalks are a good source of vitamins A, B and C along with potassium and phosphorus. During midsummer, a yellow pollen appears that can be used as flour or thickener for soups and stews. To harvest the pollen, bend the cattail head into a paper bag and shake. In late summer, green flower spikes appear and can be eaten like corn on the cob. Autumn - The root of cattail can now be harvested. Wash thoroughly and submerge in water - let sit until a gel forms. Drain the gel and use for bread making and soups. For a protein-rich flour, dry the roots and grind. It can also be roasted and ground for a healthy coffee substitute. Cattail also has many other uses. The brown, tight heads are often dry at the core (even after heavy rain) and can be used as survival tinder. Likewise, dipping the head in oil or fat will create a useable torch. Similar to down, the head yields a fluffy wool when broken apart and serves as excellent insulation for pillows, mattresses and clothing. If lost in the wilderness, a makeshift bed made with cattail down will help protect against heat loss, while the long leaves of the plant can be woven into mats and shelters. Medicinally, the gel found within the leaves act as a topical anesthetic. And a poultice made from the roots will soothe stings, burns and cuts. "Last, but not least, cattail is said to have a certain emmenagogue action and should therefore be avoided during pregnancy."